Mission: To transform research concepts from the lab to clinic-ready products. Integral BioSystems was founded by drug development experts with many years of combined expertise in pharmaceutics and the development of drug products. The company is based in the greater Boston area. 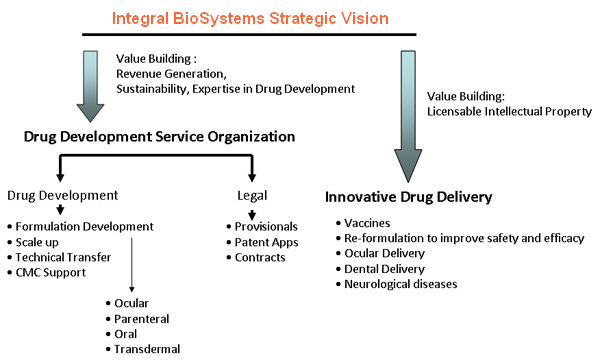 The business model of Integral BioSystems has two objectives to its niche development. (A) Revenue-Building, Credibility of Expertise, Corporate Positioning and Leadership. To establish the company as a high-expertise, efficient multi-service contract research organization in the drug development community. (B) Long-Term Value-Building, Leadership in Innovation. To leverage its expertise to develop innovative delivery solutions to global health mandates by world health organizations, in areas of ophthalmology, dentistry, vaccines and neurological diseases. We were founded on standards of scientific excellence.